Jesse shared her review of Wright's silver polish, also known as silver cream, and what she likes to use now, in the alternative. I have used this product on silver salt shakers, bowls, creamers, serving trays and silverware. I polish items whenever needed, or when they look very dingy. I have mine on display in a glass cabinet in my home, and so when they get tarnished I like to help them look better right away. I used this product for years, but I gave it up when I decided to be more "green". I didn't like the chemicals in it, or the way it left my hands almost painfully dry - sometimes even when I wore latex gloves! I never could find a list of ingredients so I don't know what it really contains it. The product worked when I used it, but so does the method I use now, which requires only aluminum foil, salt and water to remove tarnish. This product is not very expensive, about $5-6 on average from the grocery store and there are coupons around from time to time. I would give it a 3 out of 5 star rating. I thought it was a decent product, but didn't enjoy the harsh chemicals in it - especially when using such chemicals isn't at all necessary to clean silver. 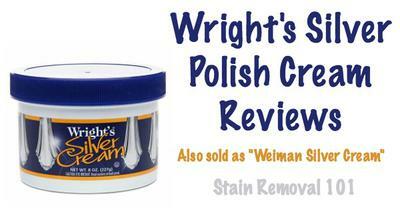 Thanks so much Jesse for sharing your Wright's silver polish review. The other is called "Wright's Anti-Tarnish silver polish" and it says it not only cleans and polishes the silver, but creates an "invisible wax-like surface that actually slows the formation of tarnish." I would be interested in hearing from even more people who have used either of these silver polishes, to share what they think of them. Wright's brand is actually one of the oldest brands still available. You can share your silver polish review here, for this or any other brand, telling me what you like (or dislike) about it, and why. In addition, you can read other reviews for other brands that have already been submitted. In addition, the newer "greener" method for cleaning silver that you mention sounds very similar to the recipe I have on this site for homemade silver cleaner, which also uses water and aluminum foil, but substitutes cream of tartar for the salt. If any other readers would like to share their silver cleaner homemade recipes here, I'd love to hear them. There are several variations of the aluminum foil cleaning method, plus I'm sure there are even more home remedies. 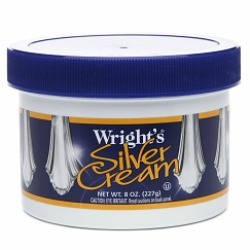 Wright's Silver Cream Polish Is The Best! I have found this to be the best store bought silver cleaner. It is simple to use and it rinses off quickly. The included sponge appears to last forever, though I clean and dry it after every use. Still, I'm intrigued by the home recipe offered here. Thanks for your review Nanny! I have used Weiman's version of this product myself and been pleased with the results. I would love to hear from even more people who've used this or another silver polish product telling me your experiences with it. You can share your review with me here and I'll add them to the site. Comments for Wright's Silver Cream Polish Is The Best! I just purchased this product from my local Walmart to polish a lightly tarnished Gorham silver plated bowl and matching candlesticks that have been carefully wrapped and stored since I received them as a gift 25 years ago. The polish didn't even touch the tarnish, even after 2 applications. Looking for another solution! I have a helluva lot of silver hollow ware. Takes about four hours to polish. I had a genius attack, put it the dishwasher with a half cup of Wright's silver cream and ran it through the wash cycle. Took it out rinsed and dried and it shines like new! Only problem was foam left in machine. Took two bath towels, mopped it out and my total personal labor time expended was less than a half hour!!!! To Carolyn, whose silverplated items wouldn't come clean with Wright's, you're items may very well be lacquered. If they have been lacquered, you can't get the tarnish off because it's underneath the coating of lacquer. I have a sterling silver pitcher that was tarnished; I couldn't get the tarnish off and it turned out that it was coated with lacquer. I'm going to have to take the lacquer off before I can polish the pitcher. I have used this for 50 yrs. since I was a little kid polishing mom's tea/coffee service. Can't be bothered with silver plated service ware, but I do keep it on had for a few odds and ends. I don't know if the lid was just on too tight, or if it is been just too long since I last used it, but my Wrights is dried out and broken up into chunks. Do I just add water? What have people actually tried?